© Rip and crosscut the bookcase back and top to size. 0 Rip a lO-in.-wide, 62^-in. strip of plywood, then crosscut the strip in half to form the two bookcase sides. 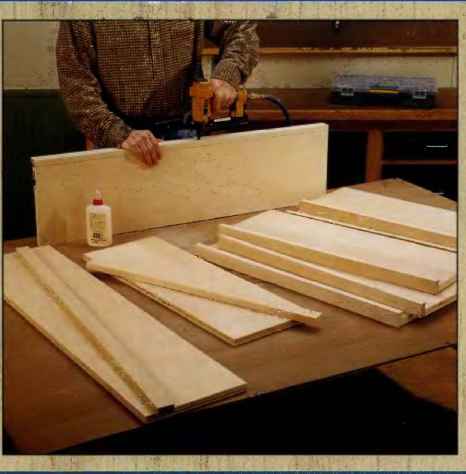 ©Lay out the three shelves end-for-end along one long edge of the plywood sheet, then cut off this strip of shelving. Crosscut the strip along your reference lines to divide it into three shelves (See Photo A). 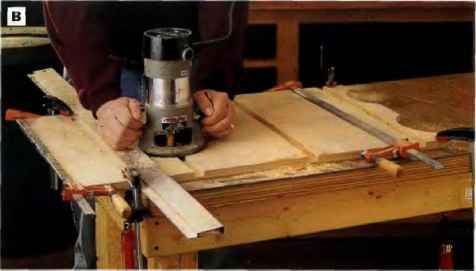 PHOTO A: Lay out the bookcase parts on the plywood sheet, then rip and crosscut them to size. We arranged the shelves end-to-end on the plywood so we could rip one long strip, then crosscut the strip twice to form the three shelves. ^4 X 11 x 32 in. 3/4 x 10 x 3lVk in. U x 9Va x 2914 in. and smooth the cut edges with a file and sandpaper. © liout the shelf dadoes in the sides. To set up for this milling operation, clamp the side panels together side by side, so the parts are aligned and configured with the arched ends next: to one another. 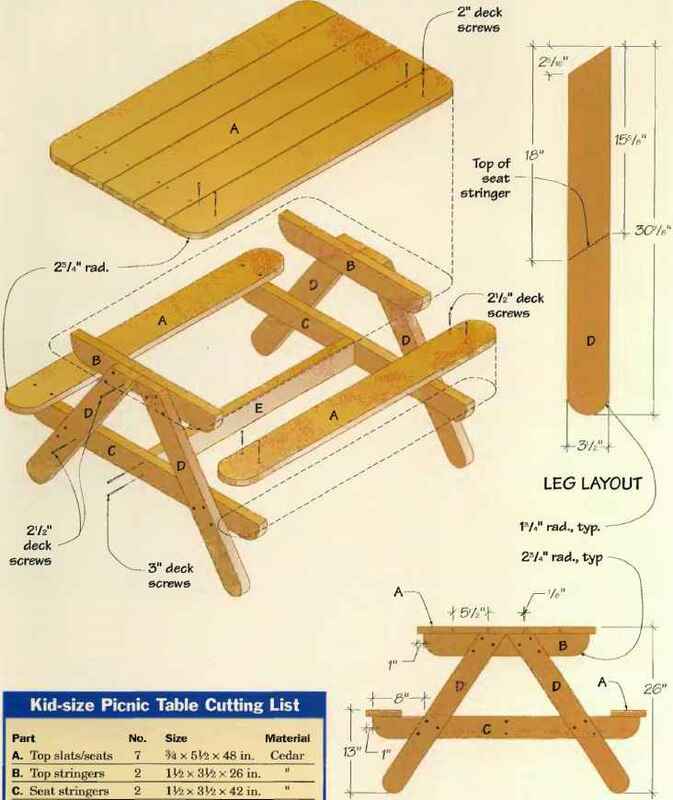 Refer to the Exploded View drawing, page 266, io mark the shelf dado locations across both side panels. Rout each shelf dado with a %-m.-dia. straight bit set to a depth of % in. Guide the router base against a straightedge clamped across the workpieces, and gang-rout the dadoes across both side panels (See Photo B). © Mill rabbets along the inside back edge of each side panel for the bookcase back. 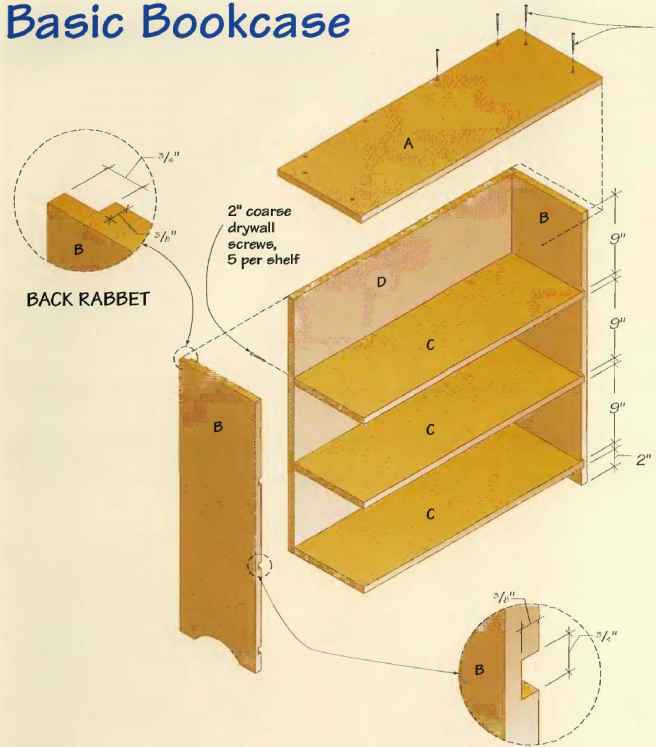 Use the same router bit and depth setting as for the shelf dadoes (See the Back Rabbet detail drawing, page 266). 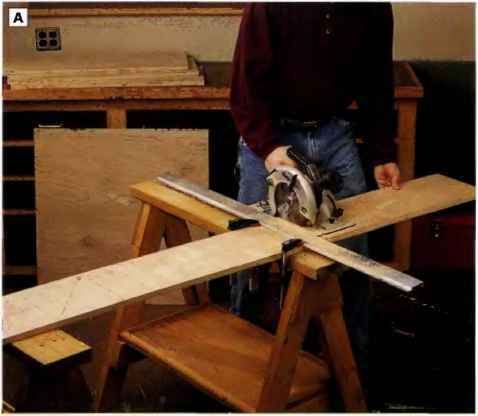 Clamp a straightedge lengthwise along each side panel to guide the router base while you cut each rabbet (Sec Photo C). © Dry-fit the shelves and back panel in the bookcase sides to be sure the parts fit in the dado and rabbet grooves. Note: Some plywood is slightly thicker than s/4 in., so the shelves may fit tightly in the dado grooves. 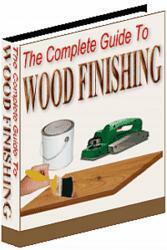 If this is true for your plywood, widen the dadoes slightly with a file until the shelves fit without force. 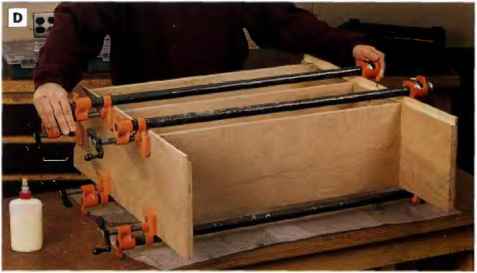 © Assemble the shelves and sides: Spread glue in the dadoes, set the shelves in place and clamp up the parts. Be sure the shelves are flush with the front edges of the bookcase sides (See Photo D). 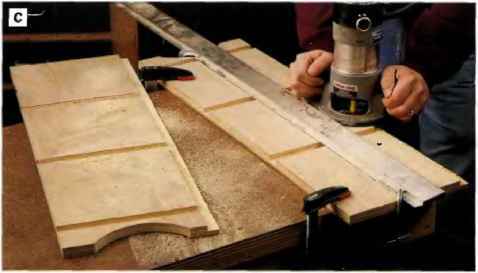 PHOTO B: Clamp the sides together side by side, lay out the shelf dado locations and gang-rout the dadoes across botfi sides. Clamp a straightedge across the side workpieces to guide the router cuts. PHOTO C: Rout ^in.-wide, 4&-ltn-deep rabbets atong the inside back edge of each side panel for the bookcase back, damp each side panel to your bench to hold It securely as you rout the rabbet, and guide the muter base against a straightedge. PHOTO D: Glue and clamp the shelves into their dadoes in the bookcase sides. Keep the shelves flush with the front edges of the sides so they don't obstruct the back rabbets. PHOTO E: Install the back on the bookcase with glue and screws driven into the back edges of the shelves. Mark the shelf locations on the back first, so you can drive the screws accurately. 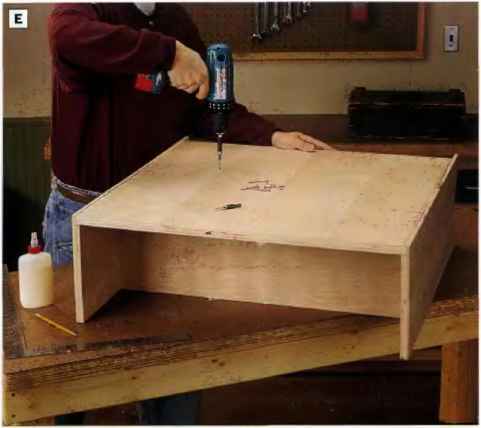 (D Fill the screwliead recesses, gaps around the shelf dadoes and any voids in the plywood with wood putty (See Photo G). © Sand the puttied areas and ail project surfaces smooth with 150-grit sandpaper. (!) 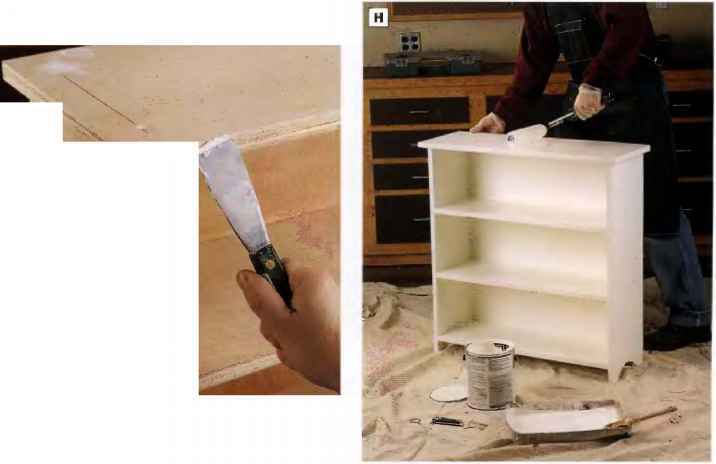 Finish the bookshelf by rolling or brushing on a coat of primer followed by two coats of paint (See Photo II). PHOTO f: Position the top panel on the bookcase and fasten it with 2-ln. drywall screws driven into countersunk pilot holes. O Install the back. First, mark shelf centerlines across the back panel for installing screws. Then spread glue in the rabbets and set the back in place so the top edges of the sides and back are flush. Drive countersunk 2-in. drywall screws through the back and into the shelves along your pencil reference lines (See Photo E). © Attach the top: Set the top in place on the bookcase so the back edge is flush with the bookcase back. The ends and front should overhang evenly. Mark centerlines on the top for driving screws into the sides and back. Drill countersunk pilot holes along these hues. Fasten the top in place with 2-in. dry-wall screws (See Photo F). PHOTO H: Roll or brush on a coat of primer to all exposed surfaces, followed by two coats of paint. PHOTO G: Conceal the screwheads and any voids or gaps In the plywood with wood putty. Sand the putty smooth when it dries. The main factor that determines the width of a bookcase Is the load-bearing capacity of the shelves. A %-in. thick plywood shelf cdn span about 30 In. without additional support before it begins to sag. 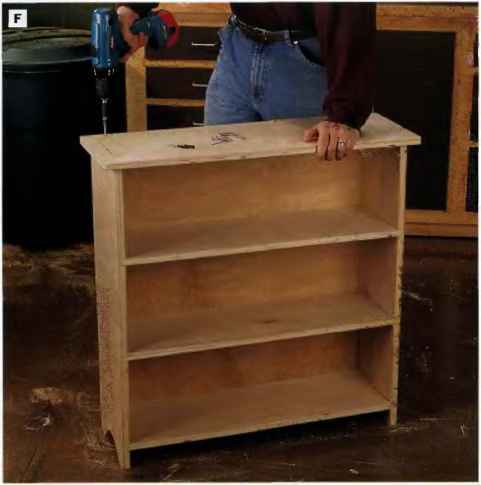 If you decide to modify this bookcase project and build it with longer shelves, stiffen each shelf by gluing and nailing a lfe-in.-wlde strip of solid wood or plywood along the front edge. You could also double-up the thickness of the shelves by gluing on another layer of %-tn.-thick plywood. A third, but more involved alternative would be to add a vertical divider at the middle of each shelf. Long before there were classrooms equipped with computers and Internet access, there were one-room schoolhouses outfitted with a chalkboard and rows of single-unit desks. These desks recall a simpler era when children needed a sturdy surface on which to practice their reading, writing and arithmetic. 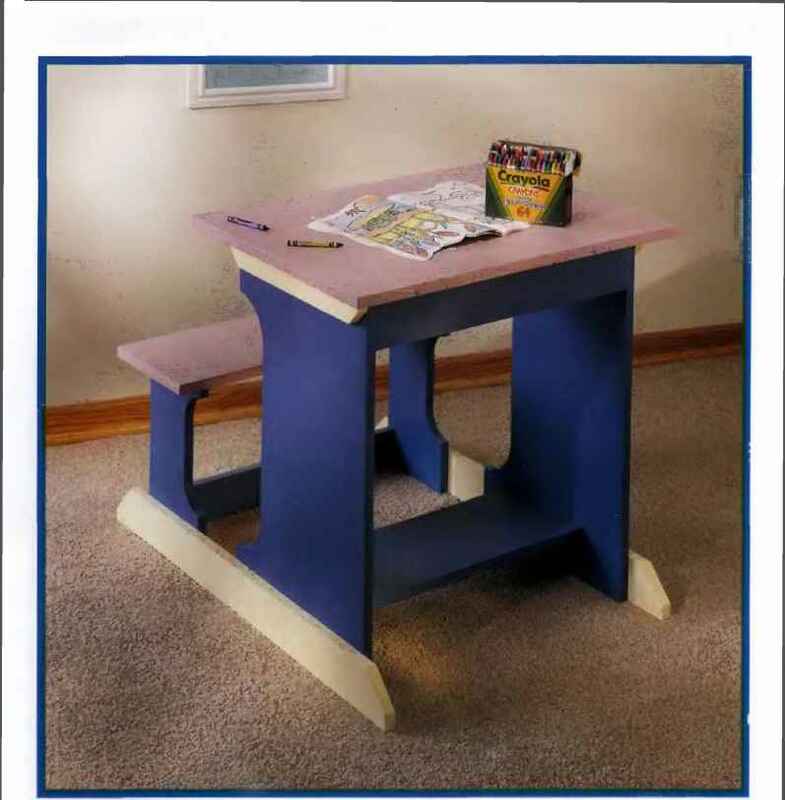 Today, a desk like this still functions for doing schoolwork at home, but kids will also find it the perfect place to color, draw or paint. There's even a shelf below the desktop to store their supplies. Best of all, the whole project is made from a single sheet of 4 x 8 plywood. Can i use a router to make a 1/4 rabbet for rear panel of bookcase?